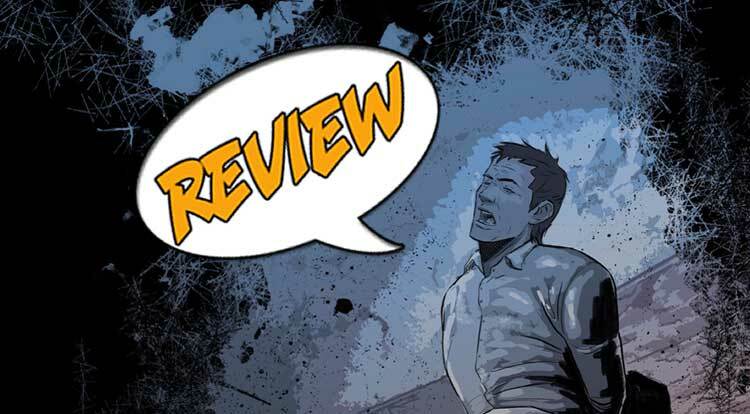 One of the wonderful things about today’s comics industry is that people who want to tell their stories through comics can do that more than ever before. I still puzzle over how many excellent tales we’ve missed because their creators couldn’t break through the publishing barrier. A good example of this change comes from TikiGod Comics, a new group of creators who promise to provide “imagination for all shapes and sizes,” according to their website. Their first series is called Angeli Arbitrium, which is Latin for “angel’s choice.” The second issue of this book has just become available. You can purchase their product through website links to iTunes and Amazon, with comixology.com coming soon. Previously in Angeli Arbitrium: This story about a world in need of saving focuses on an angel with her chosen, a man with a tarnished soul, a young woman with loss in her heart, and a boy with the capacity to change the world. They’re dragged into a fight older than creation and are given the choice we all have: To fight for good or lay down to evil. When I interviewed Mr. Bradford recently for my Wayne’s Comics Podcast episode 166, we talked about what’s taking place in this series. In the debut issue, Joe begins with James, also called Cowboy, and an angel escaping a dangerous situation. When they arrive at a small-town diner, they meet a boy who needs help. James decides to get involved, which places Cowboy in danger instead. I like the fact that even the angel has her own faults and foibles. She’s surprised when the boy can see her. James, unable to overcome the danger, is captured and taken away. In this second issue, we learn a lot more about James through visions of his past and encounters with dead friends, enemies and relatives. The script makes me feel for Cowboy since he’s had quite the tough life. Compared to James, my years have been VERY calm and quiet. We also discover more about the angel through how she’s helped James overcome abuse on several levels. The good thing is that there’s still a lot to learn about her, but what we’ve found out so far is very tantalizing. I want more, so I’m looking forward to the next issue a lot! Kay, who provides the artwork for this book, drew these first and second issues. 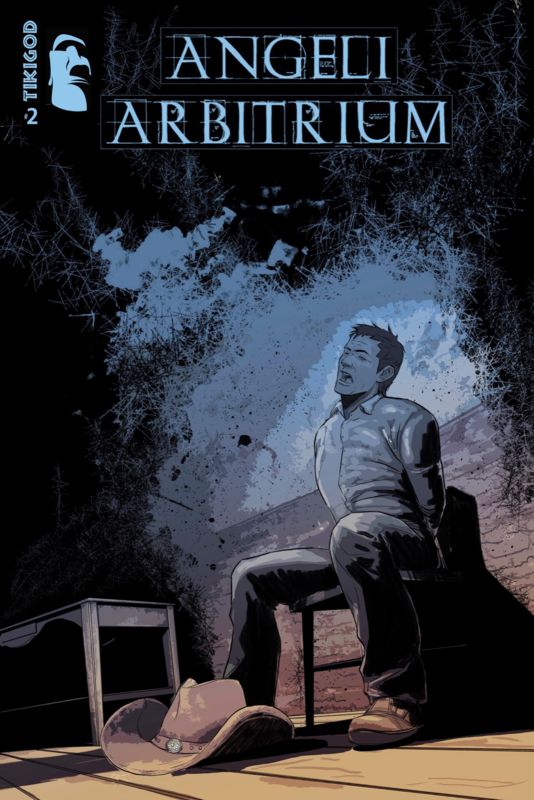 If you require a full-color comics experience, Angeli Arbitrium’s black and white art may not be to your liking. However, if you’re like me and let a book do its own talking regardless of color choices, you’ll find his artwork an ideal choice for the story. The powerful facial expressions and unusual surroundings are well-portrayed. Kay uses the black-and-white format to its full potential, particularly when bad/evil things are happening. He makes the background completely black then, which fits the tone of the world these characters (and some of those around them) are struggling in. I’m reminded of early issues of Teenage Mutant Ninja Turtles, which had something of a rough feel to the art. Like those books, this title will pull you in when you give it a chance. The human condition continues to be an endless source of storytelling. In Angeli Arbitrium, the creators appear to be saying that, regardless of the depths you’ve sunk to in life, there’s hope for turning to an upward path. If you see Joe and the rest of his group at a comics convention as I did at the first Shock Pop Comiccon, you can buy paper copies of their product from them. However, digital will be the fastest way to access their books and stories, so be sure to visit their website as mentioned above. I highly recommend this series because it’s provided a lot of the reading variety I constantly crave! And I’m anxious to try out their new books as they become available! Next Article Get over here (and watch the NSFW Mortal Kombat X trailer)!